Knesset Speaker Yuli Edelstein spoke Thursday evening at the opening of the Likud branch in Ofakim, and addressed the crisis that threatened to dissolve the coalition and dissolve the Knesset this week. "We went through a crazy week. 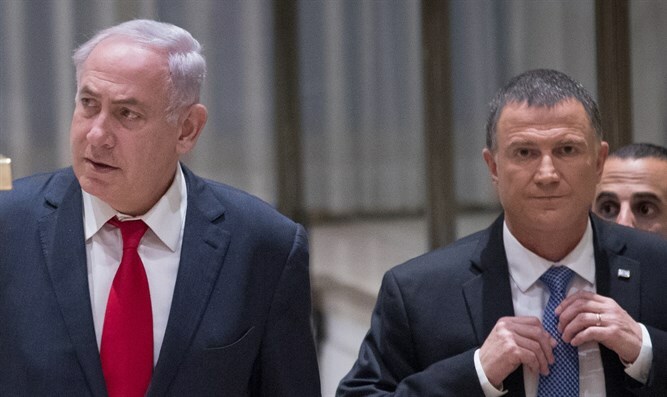 The strange dynamics of the coalition created a situation in which no one knew how to get out of the tree," Edelstein said. The Speaker said that he met with Prime Minister Binyamin Netanyahu four times during the crisis. "I saw that he did not want to force an election, but was trying to get out of the entanglement. People approached me and said that Netanyahu was raising demands to exacerbate the crisis." "I answered them - 'What do you want? That the prime minister will shake his head in order to appease the coalition partners? 'We handled the crisis reasonably, and I am glad it is behind us. Edelstein praised Netanyahu's leadership, especially his handling of Israel's foreign relations. "I have been working with Prime Minister Netanyahu for many years,. [I have been] in meeting with world leaders where he meets and sat in secret security forums. The economic and political situation of the State of Israel is excellent. Great nations like China are looking for cooperation with us, as are like many other countries in the world."